Great boulder. Needed the right beta to avoid powering out. Sometimes felt straightforward along the traverse, sometimes felt impossible. Either way, catching the flake and moving up felt very hard. Tricky bit is the catch, not the jump. Loads easier to stick in the cold. First go of the day, needed maximum freshness! Another one I couldn't get last year, but could now. Blew my first attempt greasing off the nice left hand before the top, sun started to shine directly on the holds and took a load more goes before finally sticking it. My tips are sore. Felt real progress pulling on the side pull compared to previous seasons. It's a great problem. Warmed up by trying each move and didn't stick any of them. Four or five redpoint attempts and I was at the top, always stronger when going for a send. Compression :). Found the top harder than the bottom! Wow. Looks great, amazing style, and made harder by the rocky landing. Steady moves all the way. May return for the sit. Lovely dynamic slap to a left hand sloper, and trusting it when cranking on the right high heel. Great moves, suits strong or long arms. Stiff end of the grade. Burned out trying this over and over, finally caught the positive lip. Great problem. Two knee bars, pinches, dyno, desperate top. Great location by the brook. Decent few moves and tricky top. Brimham in a nutshell. 10 stars. 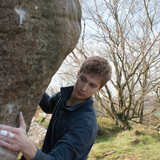 British slopers in the British sunshine. Went after I worked out some less-cramped beta. Feet stay low until reaching the top just off a high left and right hand palm. Two sessions, separated by 8 weeks of sprained ankle recovery. Satisfying to come back to the place the injury was sustained. A lovely slappy move, but not too tricky. Two evening sessions. First 7b! Tried it off most of the hold combinations to try and make sure it'd been done properly! Big first move, make it and you've done it. Nice to use finger cracks. I'd recommend trying the sit - adds an extra move of similar difficulty. James J spent all his energy working it out for me.